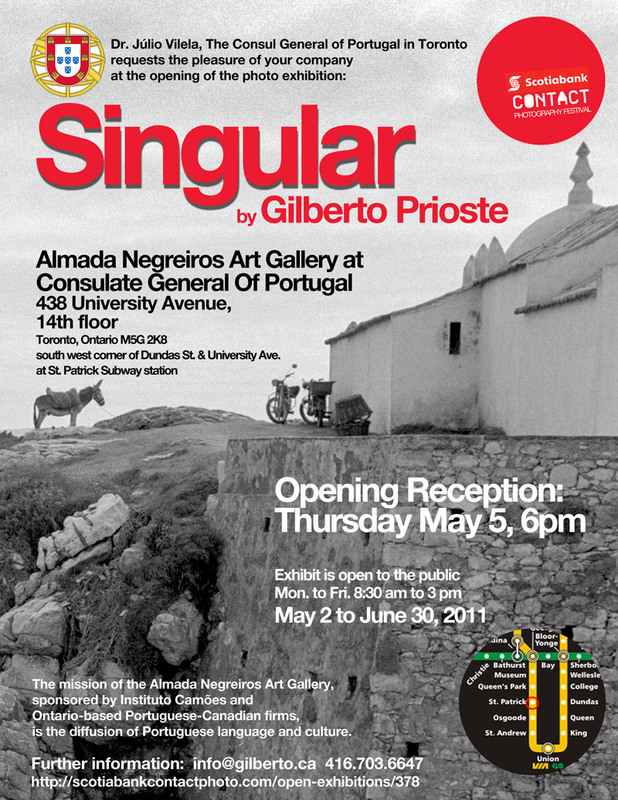 The Portuguese consulate in Toronto is hosting a photo exhibition by Gilberto Prioste, titled ‘Singular’, at the Almada Negreiros Gallery, 438 University Avenue, 14th floor, Toronto. The opening will be on Thursday, May 5th, 2011, at 6.00 pm. The exhibit is comprised of twenty one 24 by 26 inch Black & White photographs in various themes. The images will be on display from May 2nd through to June 30th, included in the Contact Photography Festival (http://scotiabankcontactphoto.com/open-exhibitions/378), taking place in May 2010, with more that 1000 participating artists in upwards of 200 venues, scattered throughout the city of Toronto. An online exhibit of the exhibition will be forthcoming for those unable to attend in person. All images will be available for purchase.